That’s a handsome suit. 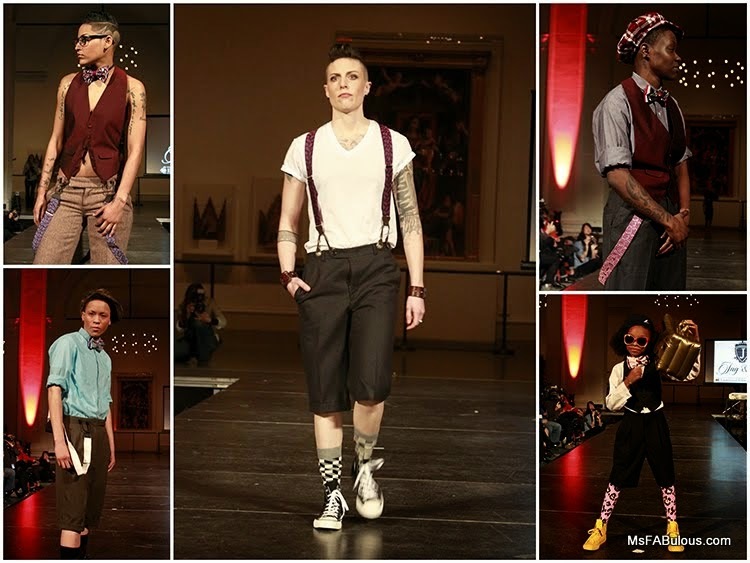 The Brooklyn Museum hosted a fantastic fashion show of masculine fashion for those who love the fit, aesthetic, women who identify as “butch” or those who identify as transgender. The (Un)HEELED showcase was presented by digital magazine Dapper Q and featured a diverse range of models that do not follow the typical hyper-feminine aesthetic of your mainstream runways. Bespoke tailoring was offered by Bindle & Keep. Their impeccably detailed ensembles also take into consideration clients with complex gender identities. You will be able to see several of them going through the process of having their suits made in an upcoming documentary “Three Suits”. I talked to Sharpe Suiting CEO Leon Wu who researched tailoring from Savile Row to manufacturing in Hong Kong. 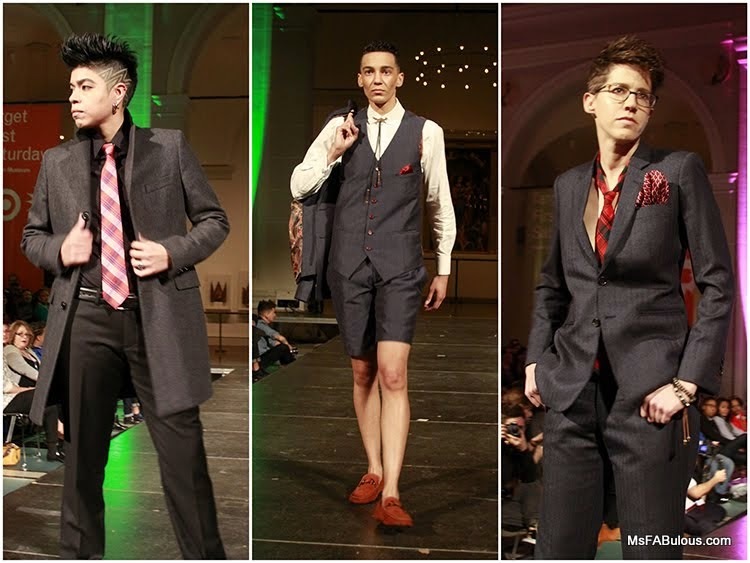 Leon created the collection to serve all body types and the LGBT community, realizing that the market lacked men’s tailored suits that were actually build to fit a woman’s body. Angie Chuang drew inspiration for her collection from the arts and blurring gender lines to serve the androgynous aesthetic. Jag & Co designer Jaguar Beckford mixes vintage dandyism, hip hop and formal masculine clothing for this label. Sir New York on the other hand, blends punk, athletic wear, Goth and street wear into the collection. Designer Auston Bjorkman is trans-identified and the label is coveted at the trendiest boutiques around the city. Saint Harridan, founded by Mary Going is a label producing formal and business suits for women of all shapes who prefer a masculine look. Saint Harridan’s models all held up signs for #BlackLivesMatter in response to the recent injustices in Ferguson and New York. At the finale of the show, Dapper Q’s editor Anita Dolce Vita came down the runway with hands raised, a symbol of “Don’t Shoot”. The Museum at F.I.T. recently paid tribute to Queer style and gay fashion. The LGBT community has always held a major influence in art, culture and style throughout history. With the exception of a few style icons like Marlene Dietrich in a tuxedo, I am surprised that this particular aesthetic or fit has not had more mainstream focus. 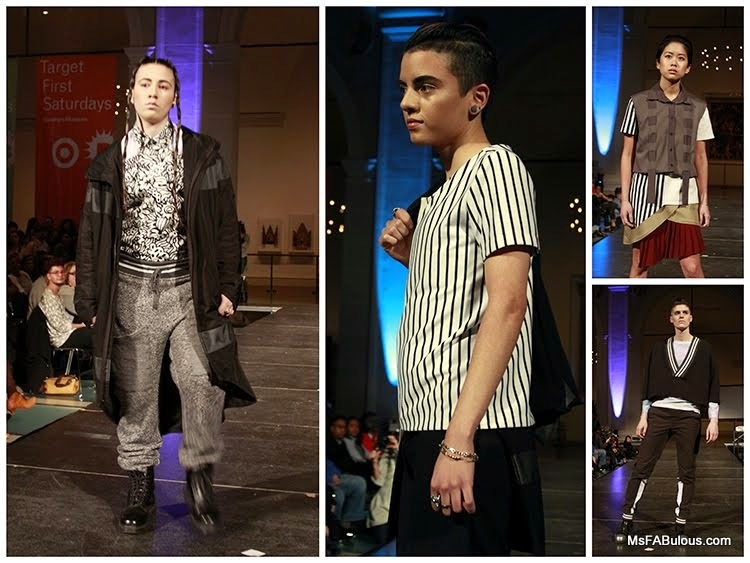 I am really glad that this show presented such a great mix of designers to show masculine fashion is more than just a girl in a boy’s clothes. They showed formal to dandy to sports to avant-garde styles.